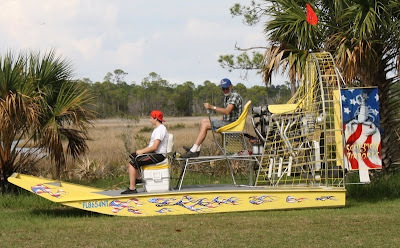 Our airboats are our passion. We have 32 years of service and love of this sport. The new "DANGEROUS LIFESTYLES"
may look the same (we keep the same paint job) but we have added the new look of a modified pancake cage-polished out and powder coated stainless. It has the dipped down nose making it look sleeker, and with the WATERTHUNDER 550 it is still all the boat we could ever want. She runs dry anywhere we wish to go, and with the decked over hull deep water is just not an issue.